Posted on Sat, Mar 24, 2012 : 6:55 a.m. Cast members from Comic Opera Guild's production of Victor Herbert's "The Red Mill." 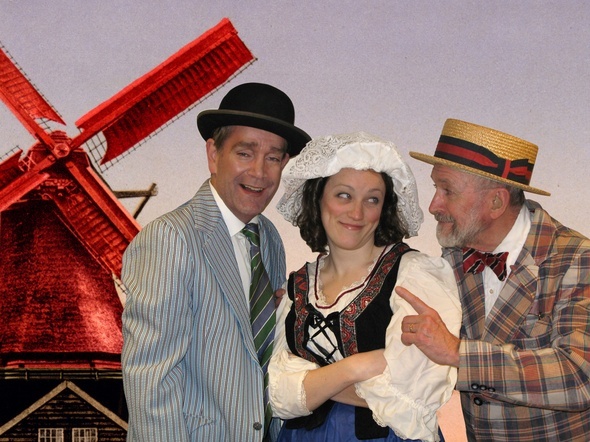 Ann Arbor’s Comic Opera Guild will present Victor Herbert's musical comedy "The Red Mill" as its sixth consecutive production at Canton’s The Village Theater, and the main show of its 39th season. Performances are scheduled for Saturday, March 31 at 8 p.m., and Sunday, April 1-2 p.m., at 50400 Cherry Hill Road in Canton. For advance tickets - $20 each ($17 for seniors, $15 for students) - call 734-394-5460, or visit www.canton-mi.org/villagetheater; tickets will also be available at the door. 17 soloists will be accompanied by chorus and orchestra, staged by Thomas Petiet and conducted by Argentinian maestro, Mariano Riera. The basic plot of "The Red Mill" is set in a village in Holland, where two American vaudevillians, Con and Kid, who have been seeking their fortune in Europe, are itching to get back to New York, but they're stranded penniless in a little inn called, "The Sign of the Red Mill." The owner of the inn, Burgomijster Van Borkum, seeks to marry his daughter, Gretje, to the Governor of Zeeland. Gretje loves merchant marine Captain Dorus van Damm, however. The Americans, along with the Inn’s maid Tina, agree to help Gretje and the Captain elope in return for passage to America. The Burgomijster, to prevent this, locks Gretje in the mill, where she pines away for the man she loves. Kid, Con and Tina try to help her escape, but the Burgomijster has made all arrangements for the marriage of his daughter to the governor, and makes sure the police will not let her leave town. The two Americans appear at the wedding festivities in disguise in a plot to subvert the wedding. When it is discovered that Captain Van Damm is heir to a large fortune, all resistance to him collapses. The lovers are united, and they, Tina and the Americans return home to old New York. The show was written for the vaudeville comedy team of Montgomery and Stone, and the Guild’s team of Keith Austin Brown and Don Devine will fill their roles. The fiery Tina will be played by soprano Giles Simmer, the Burgomijster by Guild veteran Bob Douglas, and the young lovers will be Natalie Emptage and Gyorgy Barabas. Although Dave Montgomery died in 1917, Fred Stone went on to a long career, and was the first “Tin Man” in the play “The Wizard of Oz,” upon which the movie was based. "The Red Mill" is one of those lucky Broadway shows, like “Annie Get Your Gun,” in which almost every song became well known. His scores for “Sweethearts” and “Naughty Marietta” also produced a number of hits, but no more so than this 1906 hit. The show’s most recognizable melodies include: "The Isle of Our Dreams," "Moonbeams," "The Streets of New York," and "Every Day is Ladies Day with Me." However, the show also features sophisticated ensemble work, especially in the quasi-operatic "The Accident." As with some of its other revivals, the Guild has created a new book for the show, intended to make these shows hits again for new audiences. Herbert died before the recording industry could reproduce sound accurately, and so as the Jazz Age dawned, his works could not be enjoyed in their entirety. Many of his songs became standards, but the shows eventually disappeared from the stage. COG, already known throughout the state for touring original English language productions of European operettas, has recently become the primary producer of Victor Herbert operettas in the world, with 30 titles to its credit. This production will be followed, in May, with the revival and recording of three more of this composer’s shows. Mon, Mar 26, 2012 : 4:08 p.m. It sounds wonderful! What a treat! I will be there!